“My daughter is bi-polar and it was always a challenge raising her. I had heard of NAMI before, but didn’t think I needed it. When my daughter was hospitalized for the second time, I knew I needed support! I joined the local chapter and found out about the Family to Family course that was starting immediately. I learned so much from the classes. They helped me understand more about my daughter’s disability and what I could do to support her. My husband, step-daughter and her fiance plan to take the next FTF classes, and I was inspired to become active in the organization, including volunteering to help lead future FTF classes.” -Karyn S.
NAMI SFV authors Wisdom Legacy book featuring stories of families and individuals impacted by Mental Illness. 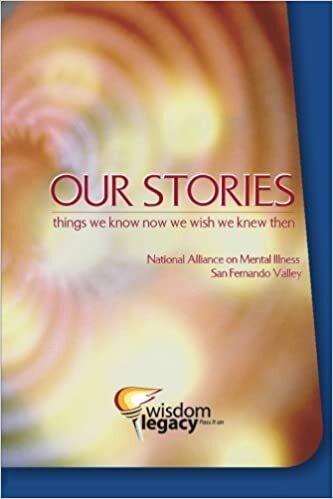 NAMI (National Alliance on Mental Illness) San Fernando Valley has partnered with Wisdom Legacy to create a book about living with mental illness. Family members and individuals living with mental illness contribute deeply personal stories to an online forum created by Wisdom Legacy with the goal of capturing and publishing one million stories. Nearly 50 NAMI members took part in the project, sharing the wisdom and insight of their experiences. “Our Stories: Things We Know Now We Wish We Knew Before” is a soft-bound book, 182 pages, with stories of the trials and triumphs of living with severe Mental Illness, recovery and treatment tips, and a glossary of mental health terms. Each purchase made through this website generates a portion-of-proceeds donation and provides much-needed funding for NAMI SFV programs and services. Available Now! Learn more about Wisdom Legacy.